I did do it yesterday. I gave in to the inevitable and applied a third coat of the light peach glaze on the hall walls. Started at the bottom this time around, in case I ran out of glaze. In the event, I didn’t. The glaze job this time around took way more than the usual eight hours. Problem was the touch up work at the ceiling. Oh, gosh, that took a long time! Fun with two colors (ceiling and top coat glaze) and the detail brush. Sometimes the sliver of green was on the ceiling, sometimes it was at the top of the wall. I used whatever was appropriate. Good thing, I’m thinking, that I decided the third coat of the top color was necessary. The touch up at the top needed blending always, and the last glaze coat gave an excuse for that. Didn’t finish up till after 5:00 this morning and didn’t get to bed till 6:00 AM. Even so, I couldn’t move on from painting and work on something else today. Noticed already last night that there were several places where a darkish strip, like a five o'clock shadow, was left at the top of the walls where I hadn’t put on so much of the light glaze. Meaning one more trip around with the ladder to take care of it! And I hadn’t done the final glazing on the wall below the stair rail, the part that will be behind the balusters when I reinstall them. All that got taken care of by sometime this evening. As I worked I had my Welsh choir practice music wafting down from my computer up on the third floor; turned up loud, so I could hear it and sing along with it. By the time I finished touching up the dark spots, had evened out some other field areas, and was decanting the remainder of the glaze into a glass jar, the concert music had been succeeded by that of my favorite Scots and Irish music CD and I figured I should stop serenading the neighbors with it and go up and turn it off or down. And didn't extract myself from the computer's embrace for two hours thereafter. It was rising 11:00 by the time I came back downstairs to finish rinsing out the little paint tray and the now-empty glaze gallon glaze can. Still, it occurred to me that not only might I remove the blue painter’s tape from the hall woodwork, I really ought to, before it stuck permanently. This was fun. Made me feel as if I had actually gotten something accomplished. But it seemed I should get even more done this evening. So I collected the heat gun, leather gloves, scrapers, and so on from the basement to see what could be done with the paint on the 2nd floor hallway floor. But no, not yet. Not until I'd reinstalled the 2nd floor wall sconce and the switchplate below it. Polished the brass switchplate first. Did do a little on the stairs to the 3rd floor, by which I mean I mutiliated the wood of the second and third risers a little more, pulling out the old copper carpet pad staples. Oh, my, there are still so many of them! ’Tis a fine irony: In all the 93-year-plus history of this house, though its walls have worn many layers of wallpaper, the 1st and 2nd floor halls and stairway have had but one coat of paint, that attractive but too dark teal blue distemper. But in the very few weeks since late July, these walls have been afflicted with ten coats of paint, and as of today, the upstairs hall boasts eleven. And now, the way my twisted perfectionist mind is working, they are in very grave danger of getting an eleventh or twelfth. I begin to think I suffer from an obsession. I like the colors of the redo of the faux finish; the light rosy peach topcoat looks much warmer with the dark green and dark rose of the base coat and first glaze coat than the yellowish-white did. The combination is so much more harmonious with the colors in the "Blackthorn" wall paper. So much is good. But Lord help me, I still am not happy with the texture. After two coats of the top color, it still seems too blotchy; the overall effect is still too sweet. There needs to be a certain opacity . . . though not so much as totally to efface the colors underneath. It drives me nutty! How did I get that smooth, bland, plaster effect on that one sample board? I used exactly the same tools as I’m using on the walls! I made myself stop and not mess with it tonight. A lot depends on how it looks in the light of day. Very likely I will want to go round lightly with the sponge and blending pad and even things out here and there, as I did on the 2nd floor this morning. If I do blow another day of my life on this, I’ll have to start downstairs this time. It's possible there might not be enough left of the light peach glaze to do the whole ten surfaces a third time, in which case it would be better to reserve the more polished treatment for the 1st floor. If I do add a third coat of the top glaze to it all-- if-- I’ll make myself do it only in conjunction with the touch up work. That's got to be done regardless. With some of the painter's tape peeled off, I see there's an intermittent line of dark green at the abutment of the walls and ceiling. Wasn't quite accurate sticking the tape up, obviously. Then there are those places here and there where green or rose or peach paint or glaze hit on the other side of the tape and wiping it off left a very visible ghost of my mistake. But I refuse to be haunted tonight. Enough of this. My padded cell awaits. I did not get the redux of my dark rose glaze completed this evening. Something not related to renovating the house came up today and I had to take care of it. But the day wasn't totally wasted. I started my shellac samples for refinishing my woodwork! Couple-three weeks ago I received three kinds of button lac, Kusmi #1, Kusmi #2, and Bysakhi, from Shellac.net. Sometime after that, I hit upon the holy grail of 190 proof denatured alcohol at Craig's Hardware just up the road in New Brighton, of all places. Sunnyside brand, at the prescribed composition of 95% ethyl (grain) alcohol to just 5% of denaturants, vs. the high-percentage methyl (wood) alcohol stuff you get most places, which can be very poisonous to use and, I am told, doesn't yield the best quality shellac. I was so screamingly pleased to find the good stuff, and so close. I mixed up a half cup of each kind of shellac, to test them and decide what I need. Two pound cut, meaning one ounce of lac buttons each. Oh, rats. My kitchen scale, never accurate, would not cooperate at all. Varied wildly. Wouldn't give the same measurement twice in a row. All right, off to the mall to buy a new scale. Fortunately, the kitchen store had a good selection and none were too expensive. To make your shellac, the lac buttons first have to be crushed up into smaller pieces. They come a good inch and a half across and look like solidified maple syrup, but I, at least, could not break them with my fingers. Tried the rubber mallet with the buttons in a plastic freezer bag. Nope, broke the bag before it broke the lac. Tried again, wrapping them in several layers of paper towel. Worked better. With the gallon can of denatured alcohol, I discovered I'd forgotten something when I bought it-- a pour spout for the opening. After drowning my kitchen counter in undrinkable booze, ended up taking the can and the plastic graduated cylinder out to the back sidewalk where, when I slopped it, I could get away with making a mess. I've got the shellac working in old clean Barilla spaghetti sauce jars. Nice, tight lids and ounce markings pressed into the glass. Yeah, they still smell a little of tomato, but that won't hurt-- I don't think. As you let the alcohol dissolve the shellac button shards, you give it a stir every so often. Like every fifteen to thirty minutes. I was doing it more often than that up until the time I finished supper and came upstairs, so they're past due for an agitation now. The shellac was doing nice things to the wooden paint stick I was using. This is going to be fun. I'm looking forward to experimenting on a sample piece of my wood trim. Oh, yeah. Not looking forward to that. As resolved, last night I prepped a sample board with streaky, pad-applied dark green paint, and late this afternoon, I applied some of the dark rose glaze to see if the walls would need a second coat of the green. Let it dry . . . yep. No escaping it. The streaks showed through. So back to the army, sergeant! Three and a half more hours this evening up and down the ladder, this time using a roller. All right, the dark green base is relaid, and it's too bad I can't just use it as my wall color. No go, since the dark wall paper is still going on the bottom under the new chair rail and it'd be too somber and gloomy in my stairhall. Besides (and it gives me no pleasure to mention this), that Behr brand flat paint chalks. Fine for a base coat for a faux finish, not so great for the wearing surface. Still not totally satisfied with the size of my sponge. Too big doesn't work, as I found out last time, but the little one I used on this board makes the texture look a little mimsey. Looks awfully pink, I know, but judging from what happened last time, I'm pretty sure that'll tone down once it's on the walls. When I was in sixth grade, the fashion for anyone who was popular or wanted to be was to put together a little volume called a Slam Book. You passed it around your class and they, each under an alias, wrote down what they really thought of you. I had my own Slam Book, of course. And on one page my sister (I recognized the handwriting) wrote, "She's too pertickuler." Well, never mind the "particular" spelling. Fact is, Lynne* was right then and she'd be right now, if she saw what I did today to the walls in my 1st and 2nd floor halls. The last two days I've been going back and forth over whether to settle for the faux effect I had upstairs when I stopped for the night early Thursday morning. By Thursday evening I'd decided I couldn't stand it and went up to the Orange Store for a new gallon of "Windsor Moss." Didn't have the chance to use it that night, and Friday (yesterday) I was thinking maybe what I had was okay after all and I'd just spent another $20 for nothing. But I woke up this morning and looked out the bedroom doorway and thought, no. Do not like it. Do not want to put up with it. Adding the warmer top coat was the right idea, but not over all the other layers. The effect is not subtle and variegated, it's just mottled. Like unhealthy skin. No. Start over. So the new green base coat is on and drying. I used a pad instead of a roller this time, and it's way faster. Only took me three hours to do everything, including ladder-moving. In the hands of someone who's not used to it, (like me!) however, the pad is also a lot messier than a roller. And lays down the paint not too evenly. I've prepped a sample board to see if I can make this green coat work the way it is. I really do not not not want to have to put on a second coat of it this time! But maybe hoping for that is just as nutty as refusing to live with the finish the way it was early Thursday. Too funny! Somebody just outbid me for that Gothick chandelier, literally in the last three seconds. Funny, because as I watched the seconds tick off with me still as the one and only bidder, I was thinking, "Well, you bought it!" and wasn't sure that was actually a good thing. But then, when it was too late to up my maximum bid-- wham! And now I'm annoyed, not because I lost the item, but because I lost the auction. Which is a different thing. Doubt I'll go back to lusting for the Rejuvenation fixture. Too screaming expensive. When the time comes to replace the dining room chandelier, I'll return to eBay and try again. You know how in my last post I admitted to casually browsing antique light fixtures for my dining room on eBay late Wednesday night? Well, now I'm trying to decide whether I'm actually going to commit to one. She's a beaut, ain't she? But I haven't decided if this is a once-in-a-lifetime chance to satisfy my yen for all things Gothick, or if I'd be acquiring a hideous piece of High Eclectic Shamanism (avec hommage to Prof. Lou Michels, my brilliant college architecture history prof) and a Wicked Waste and Frivolity. Early yesterday morning I was dreaming of this chandelier and how much I waaaaaaannnted it-- usually a sure sign I should buy something and that I will be Very Glad if I do and Very Unhappy if I don't. This piece is unique and fun and marvellous. It's exactly the right size. It has six (count 'em, 6) lights in it-- great because I read at the dining room table constantly. Oh, yes, oh, yes, want! But I looked at it again and my chikenhed streak starting leaking through. Shouldn't my dining room feature something more classical-- like this? Maybe, but the ersatz Gothicky chandelier will look loverly with my William Morris "Savernake" wallpaper and "Strawberry Thief" curtain material. Matter of fact, we can say the archer is shooting at the birds! 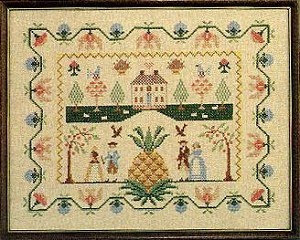 And there's that wonderful Jacobean tridarn I've been drooling over at the antique emporium up the road. Yeah, I haven't visited it for a few months and they may have sold it by now. But I can dream, right? And if I could get it, this chandelier will go with it perfectly. 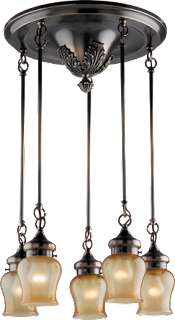 Besides, the Rejuvenation fixture I'm looking at, they want over $800 for it these days. Owwww! 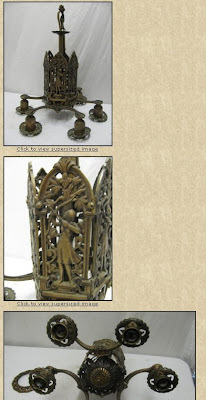 On the other hand, the 19th century Medieval fixture being flogged on eBay is, possibly, a little too idiosyncratic? So what to do, what to do? Auction ends in a couple-three hours, gotta make a decision soon! Update 8:08 EDT-- I went ahead and put in a bid on it. If I get busy and somebody else swoops in and outbids me, that'll take care of that quandary, won't it? I admit it. I delayed and now I have wimped. For the night, that is. Didn't start painting my 2nd floor hall until 8:30 PM. By 11:30 PM I had its four walls coated with what has got to be the final layer of my faux finish and the paint tray was almost empty. Excellent excuse to say phooey on it, I'll clean up, turn in, and do the rest of it in the daylight. Only I haven't done so well in the turning in department. I came up to my computer to do a quick blog post. But instead, inspired (or led astray) by Greg at the Petch House, I've spent the last, um, oh, I don't know how long on eBay looking at antique light fixtures. No business doing that right now, but no harm in asking a question or two about any that seem interesting, just in case, right? The latest layer of paint is interesting in its own way. Not madly in love with the color effect, at least not in the incandescent glow of the hall light. But after seven blinking coats I think it will have to do. In that light, at least, the peach toned glaze blends in with everything underneath and looks kind of yellow. Or-- God forbid, beige. But the textural effect is nice, and the new color's warmer and better than the cold gray-blue I had before, so I guess I can get used to it. (A lot will depend on the tone of the refinished woodwork.) Only alternative if I decided to chuck the whole thing would be to cover it all with wallpaper. Even after days of spackling and sanding, the plaster's too irregular and pitted for a flat one-color paint job. Despite the tagline of this blog, I wish to report that I am still alive and kicking and have not killed myself trying to renovate this house. Yet. I am, however, still in the throes of the ever-expanding halls-and-stairs painting project. After nearly eight hours of sponging and blending last night and into the not-so-wee hours of this morning, I completed what ought to have been the sixth and final layer of the faux finish that is to repose above the new chair rail and the William Morris "Blackthorn/Green" wallpaper in my 1st and 2nd floor halls and up the main stairway. But way before I got done, I could see it wasn't going to make it. It's partly that, again, the plaster doesn't take the glaze the way the foam core does. The pleasant opacity I got in some areas on the paper-faced sample simply wasn't appearing on the walls. The bigger problem is that the combination of colors (deep moss green, dark rose pink, and yellowish white) I chose works beautifully up close. It has depth and liveliness and even warmth. When you step back from it, however . . . Uh-uh. It's shallow and cold, the colors resolving to a steely gray-blue. When I juxtapose a sample piece of finished wood trim, the contrast between its deep mahogany tone and the new wall paint makes the latter seem all the more chilly. Before I went to bed last night (ok, this morning) I had reconciled myself to mixing up a new and warmer topcoat color and having at it again today. Back in the 1980s and early '90s I rented an Arts & Crafts style apartment with beautiful dark reddish oak woodwork. I painted my living room and dining room a light peach color. It went well with the wood and I lived with it happily for years. So now bugger whether warm peach might be out of style or not; it worked and I liked it then, I'm going with it again now. Happily, I have a whole arsenal of pots of sample paints to play with, and as of a few minutes ago I've used some of them to compound a new batch of glaze which I believe-- I hope-- will work. Last night I was seriously entertaining mixing it then and then getting back up on the ladder and working straight through till this portion of the hall and stair work was done. Thought better of it, and thank God I did. Took me nearly three hours of experimentation to get a tone I liked. (Let's see . . . 5:00 AM plus three hours mixing plus eight hours of painting [with climbing up and down the ladder, moving the ladder, adjusting the ladder, moving the lights, putting the paint tray, sponge, blending pad, etc., back up on the ladder, picking my long-haired cat's fur out of the paint job with tweezers, looking for the tweezers, settling for my fingernails when I can't find the tweezers, etc., etc. ]; add in taking out the dog, feeding him, feeding the cats [two or three times], and maybe, maybe eating something myself; factor in no sleep for a day and a half . . . and that equals, yeah, that really would amount to me killing myself trying to redo this house. (On the other hand, if I had kept at it, I could be done by now.